In an attempt to do as little prep work as possible (we are busy girls, after all), we have seriously underestimated the art of grilling. It’s fast, it’s easy and it’s quite tasty! 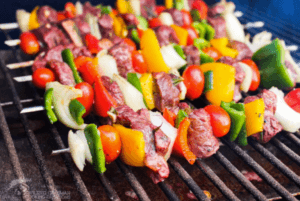 So you are welcome, simple and easy-to-make Bikini Cleanse beef skewers that will keep you feeling full without exuding too much of that precious energy. With a strict (yet healthy) Bikini Cleanse shopping guide, it can be a bit tricky to create the proper dressing for your salads and entrees. 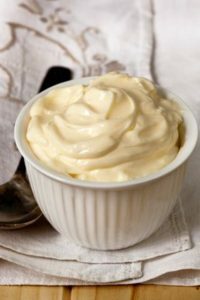 That’s why we finally concocted a Bikini Cleanse approved mayonnaise that you can enjoy on any dish you like! Of course, with such a high fat content, moderation is key. Think of this as a small treat to enjoy at the end of your day with your salad or salmon. Enjoy, bikini babes! When it comes to the world we live in and the idea of modern medicine as instant gratification the idea of sourcing your own natural remedies to lifes many side effects can be daunting. Another generational downfall is the act of prevention. It seems that we wait until we need medicine rather than acting before it is necessary and preventing its need! 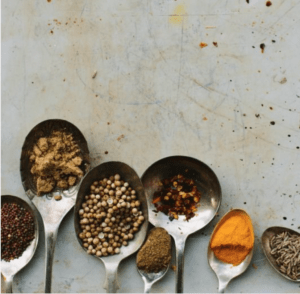 Since everyone eats, here is a list of herbs that burn and spices to simply add to your daily regime to prevent future issues and enhance your bodys health! Feel free to get creative with it as well and check out our Bikini Approved Chicken Curry recipe! Cobb salads are a fantastic way to get all your healthy fats, proteins and greens in one sitting. We took it one step further and made this already healthy salad, Bikini Cleanse approved! 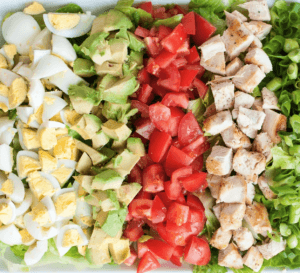 Without the cheese or the bacon, you can now enjoy this salad super clean cobb salad and sans the extra sodium. Enjoy! The week is up but packing your lunch is forever. It might not be a work day but who says you cant pack a lunch? 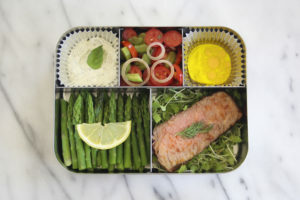 How about Bikini Cleanse Bento Box Day 6 with some hearty salmon and lots of healthy goodies! It’s finally arrived! The season every fall lover waits for… Pumpkin Spice Latte Season! 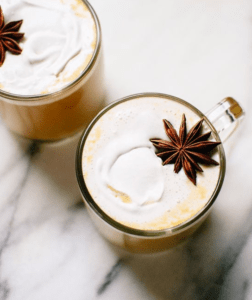 We’re big fans of this tasty, Fall beverage, but we’re not fans of this drink’s caloric intake. A grande (16 oz.) PSL with 2% milk and whip cream has 380 calories, 14 grams of fat, 52g of carbohydrates and 50 grams of sugar! Gasp! No thanks, Starbucks. We’ve come up with our own Bikini Cleanse Pumpkin Spice Tea to keep up the warmth and the calories at bay. Purchase your own Bikini Cleanse to get your hands on our tasty tea and whip up this fast, tea recipe! Mondays might just be the worst invention to mankind. So we thought we would make it easier. 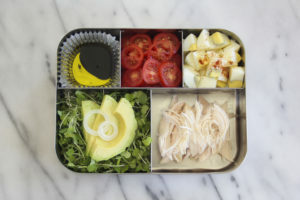 With the Bikini Cleanse bento box day 5 recipe, you’ll be a lot happier this Monday. Get the week started right with our Bikini approved chicken tacos. And don’t forget to snap a pic of your lunch with the hashtag #lovelunchagain! Ahh, chill Sunday. 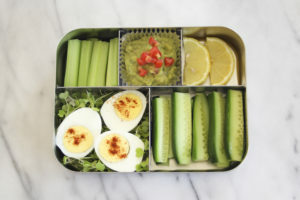 Instead of dreading tomorrow’s hard work, we’re looking forward to this amazing Bikini Cleanse Bento Box Day 4. Filled with savory prime rib and basil aioli, you will feel like you are out at a four-star restaurant for dinner. Enjoy and don’t forget to share with us using hashtag #lovelunchagain. Happy Satur-yay, bikini babes! Welcome to our Bikini Cleanse Bento Box Day 3. Luckily, school/work isn’t until Monday so we can take a much needed break. To prepare you for next week, we’ve put in plenty of protein and healthy fats to keep you full all day long. How excited are you to head back to school/work?! Okay, not really. 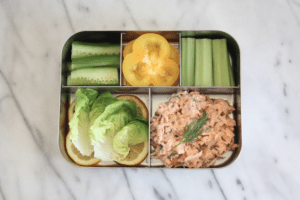 But after checking out our Bikini Clease Bento Box Day 2 combo, you’ll be skipping to lunch! Hashtag your lunch with #lovelunchagain so we can see your masterpieces. Until then, enjoy the yum! 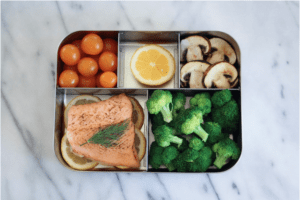 We’ve come up with 7 amazing bento box creations for you to munch on during lunch. And the best part? It’s 100% Bikini Cleanse approved! 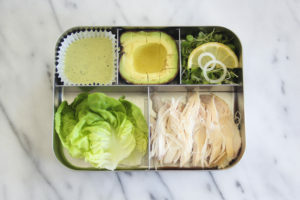 Make sure to check back on the blog for each Bento creation. 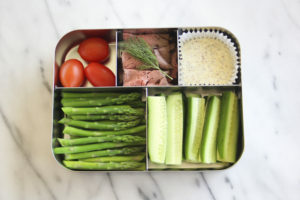 Until then, enjoy Bikini Cleanse Bento Box Day 1!